Looks the fog machine was on overdrive! Great article and I was amazed at the comments to the paper to do more stories like this one. I think Gail did a great job in telling Tylers story. Great video, man!! I started going "Woot" when I heard the "Gasoline" song come on. Please post a link to the TV news report if you are able. "Our reader comments feature is currently undergoing maintenance. Please check back to comment on this story and join the discussion. We apologize for any inconvenience." A big congratulation goes out all of the kind hearted people involved in this and to the young man this project was done for, looks like it was a great time doing something good. You don’t see much of this thing these days, so it’s great to see, only wish I was there to help out. Great job guys, High fives all around. Zeps--this build thread is going to be viewed by a lot of non-PFF people, including those fine folks in Frazee. You think you could edit your post a bit to remove the censor circumvention? This is such a great thing that has happened here. I have never been so proud to be a member of a forum before. Is it still possible to get a shirt or was that only for those that was there? x2. I'm not sure if Wakejul ever got my PM. Antuzzi ! ! ! ! ! That is AWESOME! If you want to edit and refine it a bit, as I know you HAD to toss this together fast to get this up already. I have some great video segments and photo's that you can toss into the mix if you want them. This whole experience has been just incredible! All of the time, effort, and work was so totally paid for when I saw the smile on Tyler's face when he took his dad for a drive! EVERYONE at the build was just awesome and I totally enjoyed working with each and every one of you! Damn it! Stuart and I are getting seriously teary-eyed just reading the posts, watching the videos and trying to make this post. Eep I didn't pay yet! And I had ordered a 3XL. I think our wires are crossed here. I wanted to know how much to pony up for shipping. Lemme know I'll paypal it ASAP. We left him out there! I told you I wasn't kidding about giving him and PK to Frazee as a gift from PFF! Count your blessings!! There's little children in Africa sleeping under a Baobob tree. Hulki's sleeping on the cold desert floor with scorpions, spiders and a dead camel for a pillow. You can always go sleep in a cardboard box or in the hotel dumpster ya know. I have safely made it home. JohnWPB, DIY-Stu and I left Frazee today around 1PM or so... On the way to Wadena to pick up the highway towards Sauk Center, we were drifting off as we drove. For safety, we agreed to stop in Wadena and catch some sleep. We ended up crashing out for 2-3 hours, but did not sleep well. Just enough to get us moving. That Kia body kit has a lot of trunk room. I may have to look into it down the road. Thank you all for your support this weekend! Thank you to everyone who made it up to Frazee to help out! My sincerest apologies to anyone I may have snapped at this morning around 4 AM. Daddy gets cranky without sleep.. You understand. The grand "Reveal" was an idea I had rolling around in my head. I visualized the car rolling forward out of a fog filled garage, barely visible, and pulling the fog behind it. Well, it worked great. Even the news people thought the fog was a nice touch. A bit theatrical? Yes. In the end, it really helped add some drama to the culmination of many hours of very hard labor to make the car into what it is now. I worked very hard to make sure the sound system was performing at it's peak. It worked great to be able to pull the car out of the garage with "Gasoline" cranked to the max volume... You could have heard it for 4 blocks. The entire sound system is tuned for quality over quantity, with the ability to gain a LOT of quantity any time Tyler wants to rock out. Tyler, you now have a car that many on PFF are jealous of... We had to fight very hard to keep others from trying to lay claim to it before it was even finished. I am honored to have been a part of this. We had a great team with a collective amount of knowledge of the Fiero, even Wikipedia can't keep up. Count your blessings!! Hulki's sleeping on the cold desert floor with scorpions, spiders and a dead camel for a pillow. Wait, Don you don't do humor? You and Hulki are definitely the man(men?). Without his initial idea and your initiative to get it rolling(and butter smooth, I might add) none of this would have gone down. I'm still awe-struck how it came out. I was talking to PK86 on the phone earlier clamoring over how awesome it is, and him rightfully so saying pictures just don't justify it. I can only imagine the car in person. Tyler truly has a car to be proud of right now. Go get some well deserved sleep, Synth. You and the build team earned it in spades. I hope this turned out to be more than you could have imagined, and I hope this keeps a smile on your face for a long time to come. You and you're family are outstanding people, with a close family that is such a hard thing to find nowadays, even in my own. Tyler, I also want to thank you for what you did for us. Without you, our community would never have had a chance to form the bonds that have been made over the last 2+ weeks. There is something very special about you, and I'm not the only one who sees it. You and your family are forever a part of ours. My family and I continue to pray for you and your family everyday, and we know God watches over you. It was great to get to talk to you over the webcam, you're smile is forever burned into my memory. God Bless, my friend. I have been searching my head all day for the right words to say, but there are no words to describe the level of pride I have in you all, and all of the hard work everybody put into Tyler's Toy. Seeing Tyler's smile on his face when I talked to him over chat, and watching him drive his dream at the reveal.....I just don't know the right words. You all gave so selflessly, and continued to give throughout the whole project. The build team worked for over 24 hours straight without sleep, they were like a machine. Your hard work really showed when I saw the pictures of Tyler's Toy. Chris, I especially thank you for taking the ball and running with it. Without your dedication and perseverance took this project to the level it became. You have all restored my faith in this forum and people in general. I can't write this post without tears, so this is where I am ending it. Thank you all, my friends. For those interested. I posted pictures of the plaque that was presented to Tyler yesterday during the build. I started a thread where members can post their thanks to Sam Shepard. I am going to forward a link to Sam who did the actual fabrication for me. I'll try n remember to post a hi res pic of the group tonight at home, I'm back at my job today. Amen to that. Great job the car is awesome! Andy and Chris thank you. 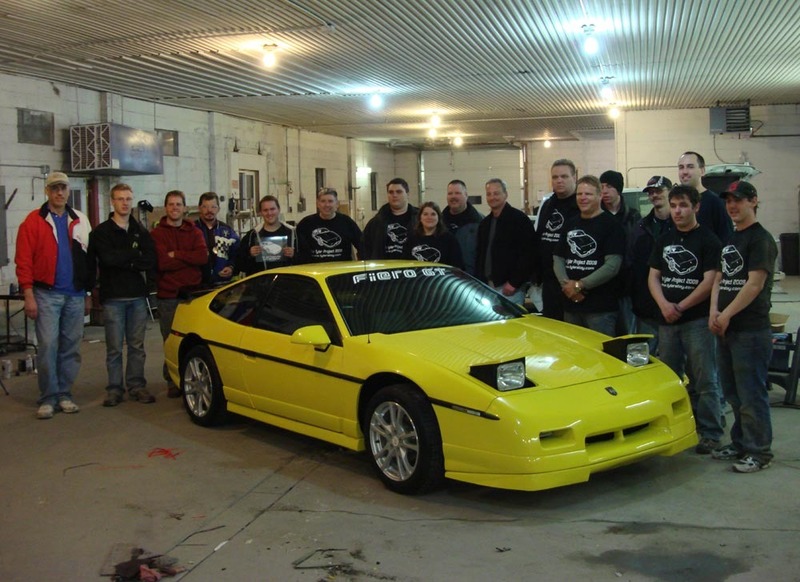 All of us in the Fiero community, because of the unselfish act by members of our community the Fiero and car clubs have been given a different outlook instead of the stereo type that was in the past. Great people here in this community. Tyler you are blessed. The community you live in is fantastic. Though I have not been there, just seeing how they support you is just fantastic. Makes one want to pack up and move to Frazee! Tyler you have some great friends! Friends like that are priceless! I would like to remind everyone that any picture posted on photo sharing sites and social networking sites may get lost. If you us PIP or MYFiero.com then the pictures links wont get broken if an account is shut down or exceeds bandwidth. This is from a Gentleman in Frazee, he sent me the links to his sons Facebook where four videos were located. I just put em together, and uploaded them. 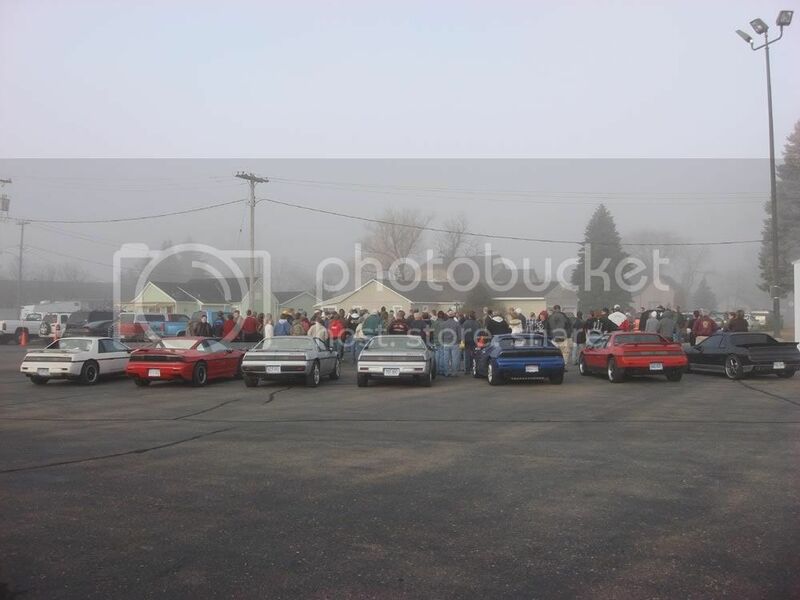 KEV and I made it home after about a 3.5 hour drive... the term sore when trying to extract oneself from a Fiero after work like that doesn't even cut it... I am glad that JohnWPB made it back to sunny Florida, as he missed his first flight. Shawn Yoraway, Purple Reign aka 'Trunk Monkey', rode his GSX-R 1000 back home and followed us for a ways... Glad to see everyone made it back safely. Well, we'll still have to see for PK86 and 'Tuzzi. The reveal was awesome. Well done, Synthesis. The team was awesome. Well done team. I have been working (with danyel, silent and others) at saving these for this very reason. For awhile local Frazee people were sending links to their pictures and Video's on tylerstoy chat, we tried our best to grab, and save them as they came up so they could be found later. I am uploading everything I received to www.tylerstoy.com so they will be there, as well as on my hd.